Finding top blogs that don’t link to you is a useful, practical exercise – once you find them, you can make efforts to get backlinks from them. 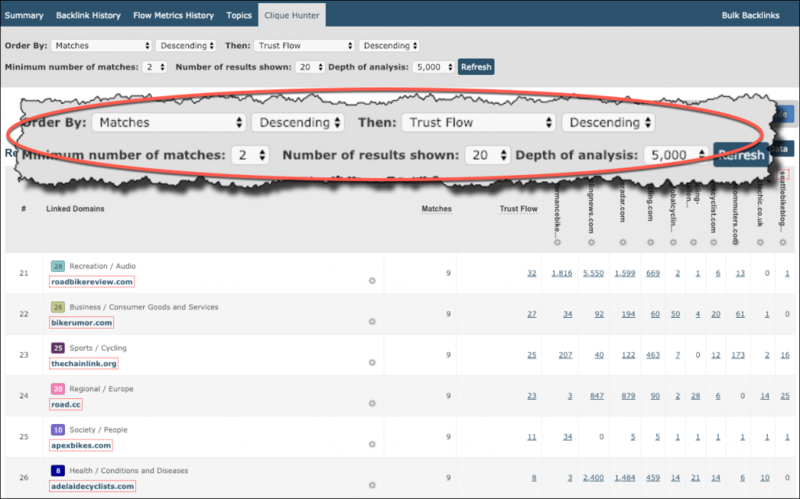 You can use Clique Hunter to do this analysis for you with a simple little hack – here’s how. So what’s this about? 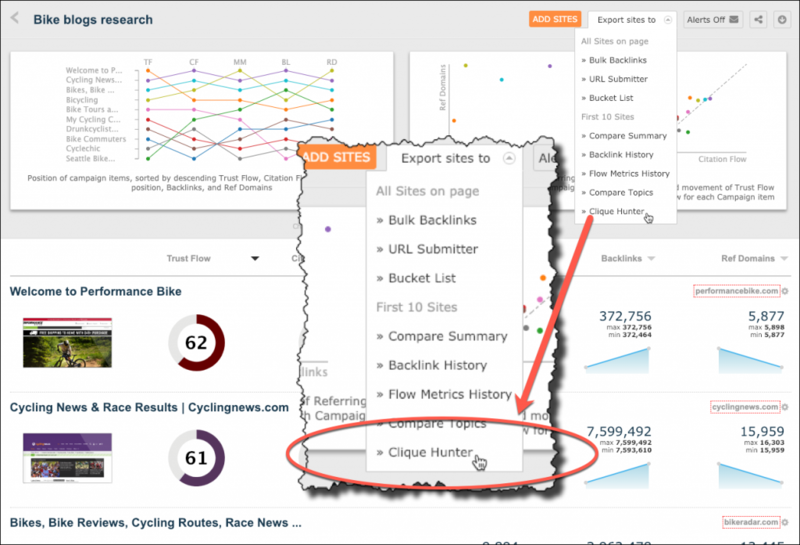 In this example, I started with 9 of the most popular cycling blogs to use in Clique Hunter. If you’re familiar with Clique Hunter, you know that you can have up to 10 sites – so why am I deliberately one short? Well, that’s where the hack comes in. Instead of another blog, if I add my own domain to the list, then I have an easy way to find multiple prospects that either already linked to me or that don’t link to me. In this example, I’m going to use PerformanceBike.com – a website I have absolutely no relationship with – other than finding that it is a website that has a really good link profile and some very tasty links. Another that contain a list of 2443 sites that didn’t link to PerformanceBike.com. First, a campaign directed at the major sites that don’t link to PerformanceBike.com, chosen from the 2443 on my list. Second, a campaign directed at major sites that already link to me – but could well be persuaded to link to that brilliant new piece of content I’ve created. 1. Build a list of top blogs through searching on Google. Scan through the search results and pick the lists you find the most attractive. For example, Cassidy Bigsby created a nice collection of blogs at Apex Bikes – https://www.apexbikes.com/best-pro-cycling-blogs-for-beginners/ . 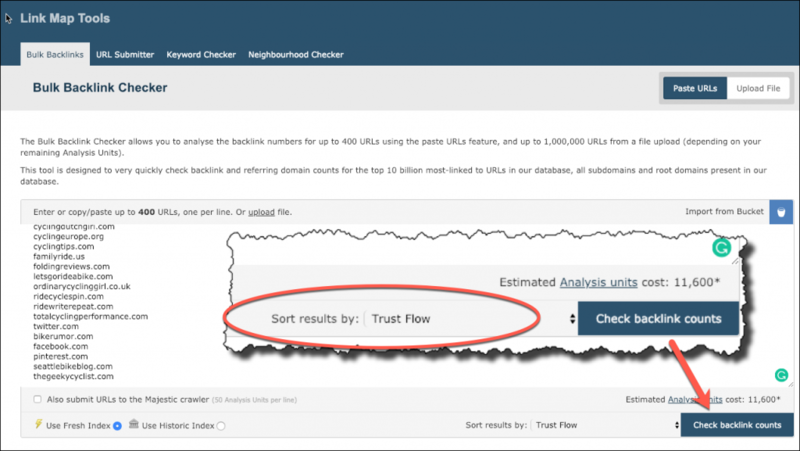 Now copy and paste the blogs you like into Bulk Backlinks and choose sort by Trust Flow descending. 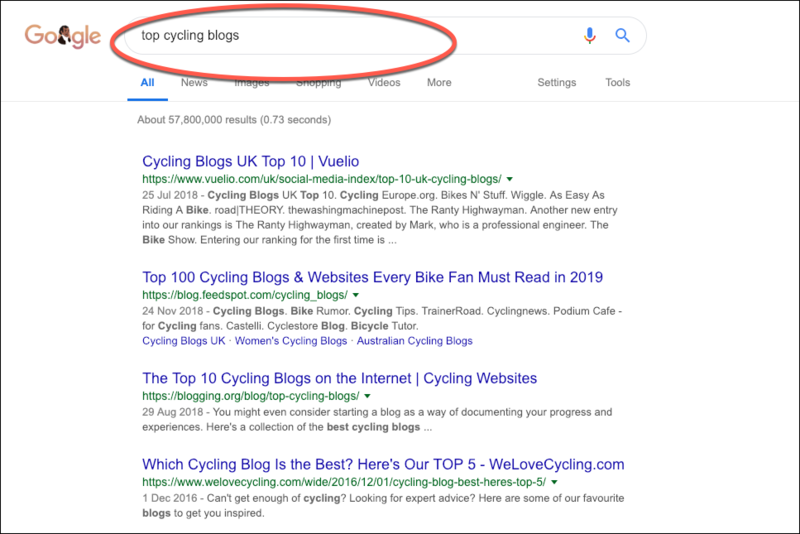 Hit ‘Check backlink counts’ and you now have a list of top cycling blogs ranked by Trust Flow descending – so the most authoritative blogs appear at the top. For this exercise, I’m going to use the top 9 and create a campaign around them using the Majestic Campaigns feature – see next step. 3. Add up to 9 root domains with the highest Trust Flow to a new campaign in Campaigns. Beside each domain there is a cogwheel – click on that and you get a list of actions you can take. I’m going to choose ‘add to a campaign ‘ and here I’ve chosen to add BikeRadar.com to a campaign. When I click, I can add the domain to an existing campaign or create a new one. Now, here’s the hack – add your own root domain to the campaign to give you 10 root domains in total. Adding your own domain at this stage is crucial for this exercise because that lets you see which blogs are not linking to you! 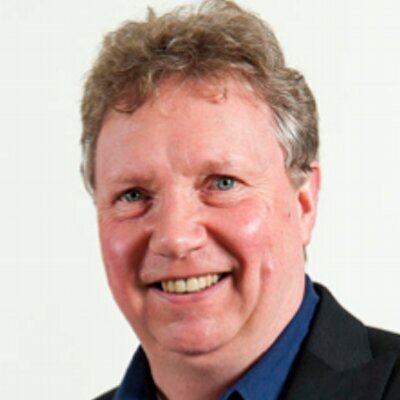 Set the depth of research to the maximum so you get as many prospects as possible. 5. Download the results in Excel and open the file. 6. 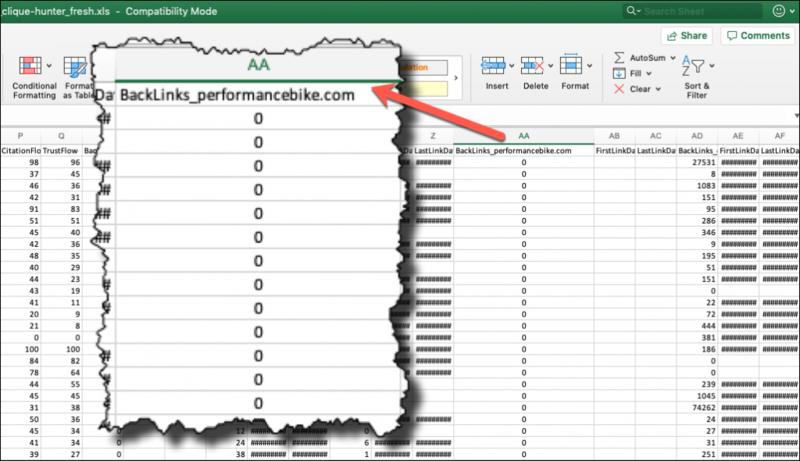 In Excel, select all the results and find the column that contains backlink scores to your own domain (you’ll see it listed in the ‘sort’ dropdown menu in Excel). Sort this column by value ascending. This moves all the domains that have a score of ‘0’ to the top of the spreadsheet. Rename the sheet ‘sites not linking ‘. 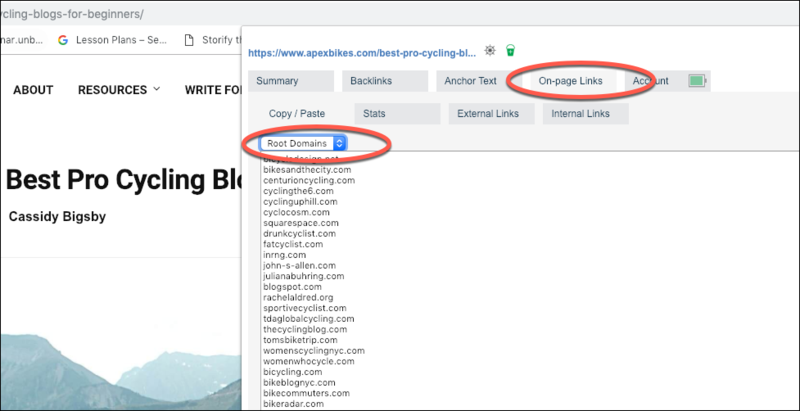 Now look for the ‘border’ between sites that are linking and those that are not – that appears when the column of zeros ends, and you start to get numbers – which are sites that do link to PerformanceBike.com. 7. 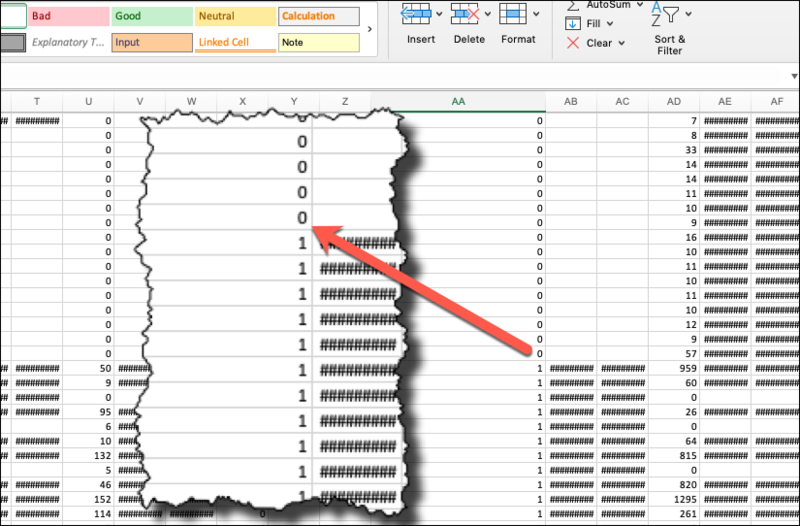 Create a second sheet in the Excel file and re-name it something like ‘sites already linking’. Leave the domains with a score of zero where they are, and ‘select and cut’ all the other domains. Create a new sheet in your Excel file, re-name it something like ‘sites already linking’ and paste the domains. 8. 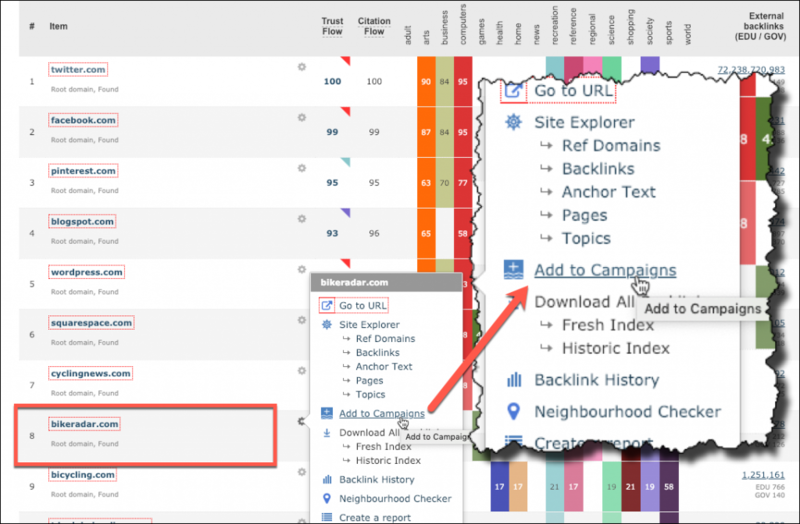 Now you have 2 lists of domains – those that do not link to you, and those that do. According to your own priorities, you could design a link building campaign targeted specifically at those that do not link to you. And you could also have a campaign targeted at sites that already link to you with the idea of getting them to link again to new content you have created. Ken, I love this technique especially for newer sites. I will roll this out to my team and see if we have any good results. Thanks, man. Thanks, Christopher! I’m glad you like the idea! Please drop me a line and tell me how your team gets on! And if you have a story to share, please let me know. Hmm, great way to find sites which do not link to mine, but I was kind of expecting some ideas on how exactly get any of those sites to link to me?! I’ll work on that and develop some solid tips. Watch this space!